Myanmar has not met the minimum standards in investigating or prosecuting those engaged in the violence against the Rohingyas, said UN High Commissioner for Human Rights Zeid Ra’ad Al Hussein yesterday. GIVEN THAT the majority of Myanmar people lack the knowledge to use digital payment platforms, all the players in the finance industry must work together to educate them so the nation can become a cashless society, according to Arturo Planell, country manager of Visa Myanmar. The National Network for Education Reform (NNER) said the higher education bill proposed by the Ministry of Education does not guarantee academic freedom and is not up to the standards of democracy. Myanmar authorities are planning to grant visa-free access to Japanese and South Korean tourists, as well as visa-on-arrival service for Chinese visitors who come on group tours. Rice prices may see increase in the domestic market as rice reaped in the summer had almost run out, according to sources from the Bayintnaung wholesale center. The aquaculture production survey, conducted jointly by the Yangon Region Fisheries Department and Food and Agriculture Organisation (FAO), in 16 townships is slated to end by the end of April 2019. Dagon International will develop an industrial park here dedicated to food processing, the Myanmar conglomerate’s leaders told Nikkei on Thursday, tapping agribusiness in an effort to diversify beyond the core real estate segment. The top U.N. human rights official called on the United States on Monday to halt its “unconscionable” policy of forcibly separating children from migrant parents irregularly entering the country via Mexico. Plans are underway to provide lifejackets to the migrants’ children who are going to the school in Myawady Township by passing through Mori River. A police witness in the case against two Reuters reporters accused of possessing state secrets in Myanmar is “unreliable,” the reporters’ lawyer said on Monday, because he obtained testimony from previous witnesses, in violation of police code. After six months of preliminary hearings, a Yangon court will decide next month whether two Reuters journalists arrested while covering the Rakhine conflict will be charged with violating the Official Secrets Act. Five Myanmar refugee organizations from New Delhi, India will hold a ceremony to mark the World Refugee Day on June 20. Today, countries throughout the world are facing complicated challenges in various sectors, which cannot be overcome single-handedly. Countries having similar cultures, historical backgrounds and ideologies must unite to confront these challenges. A new Tug Boat constructed by Myanmar Shipyards Joint Venture Company will be transferred to Myanmar Port Authority according to Myanmar Port Authority. 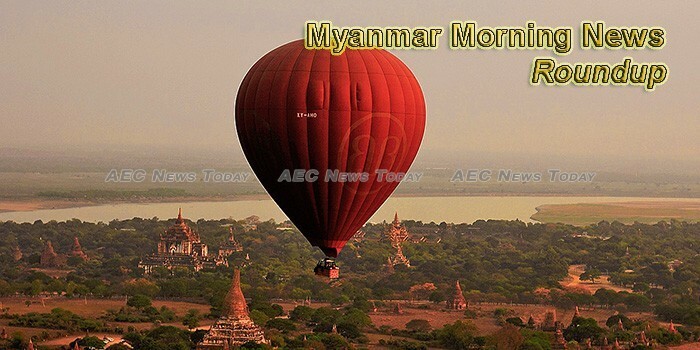 China, it seems, has not given up hope of restarting its hydroelectric power project at Myitsone in northern Myanmar. Rockstart Impact, an accelerator programme focused on developing countries, has begun its first programme in Myanmar in March this year. The export of Myanmar’s Sein Ta Lone (diamond solitaire mango) to Singapore is suspended owing to trademark infringement since early June, said U Kyaw Soe Naing from the Myanmar Mango Market and Technology Development Association (MMMTDA). The Mandalay Region National League for Democracy (NLD) Party Chairman Tin Htut Oo said that there were 16 party members who applied to contest vacant seats in Mandalay Region in coming by-elections. Bangkok-based Phayathai 2 Hospital hopes to increase foreign patients, including those from Myanmar, to come to its renovated new heart centre, according to a hospital executive.